Lawmakers in Denver are busy this week wrangling with the state budget—especially in the wake of a dismal revenue forecast last week that put some spending projects on hold—but for Northern Colorado legislators, uranium mining is still on the front burner. A bill by Fort Collins Democratic Reps. Randy Fischer and John Kefalas, sponsored in the Senate by Republican Steve Johnson and Democrat Bob Bacon, might be back on the House floor by the end of the week. The Colorado House of Representatives initially tackled the bill on Monday, but some lawmakers worried about a few provisions that pertain to conventional uranium mining. After a few minutes of discussion, Rep. Terrance Carroll of Denver, the Democratic assistant majority leader, pulled the bill from the morning’s list. Because the House will debate the budget, known as the “long bill,” all week, it might not be up again until Friday. But Fischer and Kefalas said they were confident it would pass, and in an interview last week, Gov. Bill Ritter said he supports it. The bill is in response to Powertech Uranium Corp.’s Centennial Project, north of Nunn and between that town and Wellington. The area in question is about 13 miles northeast of Fort Collins. Many Northern Colorado landowners are fighting the mine, citing concerns about their health and the area’s groundwater. Powertech estimates that 9.7 million pounds of uranium lie beneath a 15-mile chunk of land in the area. Powertech officials have told Fort Collins Now in previous interviews that the company will only apply for permits to extract uranium through in-situ, or in-place, recovery; the company will not file a permit to conduct open-pit mining. Some lawmakers worried about a section in the measure, House Bill 1161, which deals with conventional uranium mining. That kind of mining is conducted like hard-rock mining, in an open pit or mine. But the meat of the bill deals with in-situ leaching of uranium. A designated mining operation means a mine in which toxic or acidic chemicals are used, or where acid or toxic materials will be exposed as a result of mining. The state has strict oversight of such mines. That specificity came about after the Summitville Mine disaster in the early 1990s. The mine, in Rio Grande County in southwestern Colorado, became a Superfund site after a Canadian-based company declared bankruptcy in 1992, leaving behind cyanide-laden water, acid drainage and other hazards. The disaster happened after a new technique for mining gold, which had been done at Summitville since 1870. The process was called “heap-leach,” in which ore excavated from the mountain was crushed and piled onto a lined pad, and a sodium cyanide solution was poured over it to leach out the gold and silver. Almost immediately after its construction, a leak was discovered that allowed hazardous chemicals to leach into nearby water bodies. Most conventional uranium mines in Colorado were given permits before Summitville and the resulting law change. But under the law, suspended uranium mines and brand-new ones are treated as designated mining operations. Kefalas said he and Fischer’s bill simply notes that distinction, but some other lawmakers were concerned about its scope. “The thrust of it, that colleagues need to understand, is that this bill is targeting in-situ leach mining, in terms of requiring the various things like mine site characteristics, to look at the groundwater parameters, and other applications. That only pertains to in-situ leaching. Where conventional uranium mining comes in, is making sure that its status is as a designated mining operation so that all of these mines that are looking to reopen have to go under the post-Summitville requirements,” he said. In-situ uranium mining uses a chemical process to coax uranium out of water-bearing sandstone layers. Water in the sandstone is oxidized, which mobilizes the uranium, and the liquid is pumped back to the surface. The uranium is removed from the water and the process starts again. Opponents worry that other heavy or toxic metals could be mobilized in the process, thereby contaminating underground sources of drinking water. But industry officials say other elements in the rock will prevent uranium or other metals from traveling beyond pre-determined well areas—many of which contain water that is already undrinkable. A representative from Powertech said the bill has come a long way since it was introduced—Powertech and other mining industry representatives held lengthy meetings with the bill's sponsors—but added that more work must be done. "Key areas of the legislation, especially as it pertains to how groundwater restoration and monitoring will be documented, still need to be clarified," Powertech president and CEO Richard Clement said in an e-mailed statement. "We will continue to work with the bill’s sponsors to improve the legislation to create fair and effective public policy for Colorado." Gov. 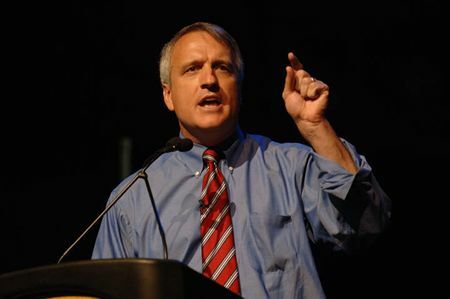 Bill Ritter said he supports HB1161, noting that Colorado does not have a regulatory structure for in-situ mining. The process is not new, but is likely to become more common because it is less intrusive than a conventional mine. The bill still faces several hurdles before Ritter would have a chance to sign it, but its sponsors feel confident, Fischer said. “Rep. Kefalas and I have done our homework, and based on the conversations we’ve had with our members, with our colleagues on the floor, we believe there is plenty of support to get this bill out of the House and over to the Senate,” he said. Kefalas said he hoped the bill would move forward, perhaps as early as Friday or Monday, March 31. “As you can see, it’s never over ‘till it’s over. But I think this thing is ready to get done in this session,” he said.